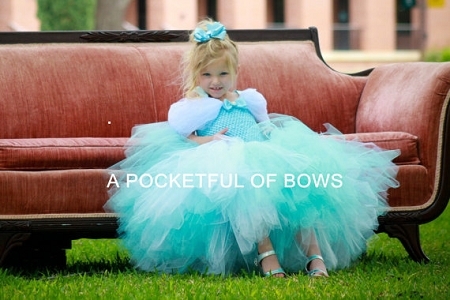 Your daughter will feel just like Cinderella in the beautiful dress. This dress is light blue and white. 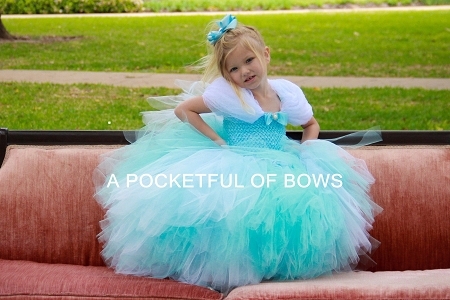 The top is lined and has soft white sleeves and a bow with a rhinestone gem center. 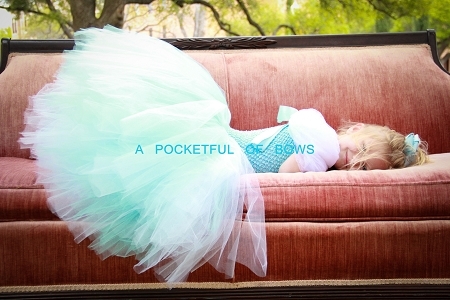 The satin shoulder straps tie in a bow on the back. This dress has a super full and fluffy skirt. The skirt is light blue and white. It is made with 150 to 450 yards of tulle. Other Princess Couture dresses available please message me your request! LONGER LENGTHS UP TO 36 INCHES ARE AVAILABLE! Length under 24 inches in the Toddler Tutu Dress section! PLEASE ALLOW 1 WEEK TO MAKE YOUR DRESS. Need your dress sooner please message me your request! Thank you to our beautiful model Jillian!! !